1. Aggregate Information. QuikTrip may collect IP address (but not the email address) of any visitor to our Digital Properties. The Digital Properties also track the pages within our Digital Properties that you view, the date and time you view those pages and various other statistics. This information does not identify you personally. We use this information to help us evaluate visitor traffic patterns and improve our Digital Properties by making our systems more responsive to the needs of visitors. 2. Personal Information. When you choose to provide it, we collect personal information such as your name, address, telephone number, financial information, email address and other information, in connection with services and products available or described on the Digital Properties. 3. Cookies. Like most businesses operating websites and/or mobile applications, we may track your visits to our Digital Properties by giving you HTML 'cookies' when you enter. Cookies are pieces of information transferred to your device's hard drive or shared with your device's temporary memory for record-keeping purposes. Cookies are not computer programs and have no ability to read data residing on your device or instruct it to perform any step or function. By assigning a unique data element to each visitor, the Digital Properties able to recognize repeat users, track usage patterns and better serve you when you return to a particular Digital Property. For example, a cookie can be used to store your preferences for certain kinds of information or to store a password so that you do not have to input it every time you visit one of our Digital Properties. Cookies also help us to collect anonymous click-stream data for tracking visitor trends and patterns. Our cookies do not store personal information. Most browsers are initially set up to accept cookies. If you prefer, you can reset your browser either to notify you when you have received a cookie or to refuse to accept cookies. You should understand that certain areas of our Digital Properties may not function properly if you set your browser not to accept cookies. QuikTrip collects and uses your personal information to operate the Digital Properties and deliver the services you have requested. QuikTrip also uses your personally identifiable information to inform you of other products or services available from QuikTrip. We may also contact you via surveys to conduct research about your opinion of current services or of potential new services that may be offered. By providing personal information into any of the above areas, you grant us permission to use such information for our business purposes, including without limitation contacting you regarding product or service offers or customer survey requests, and you grant us permission to securely transmit your personal information to third parties to fulfill our business purposes. Further, we may contact you about selected products, services, companies and events that we think may interest you or to contact you regarding your requests, questions, comments or other information you have provided. QuikTrip does not sell, rent or lease its customer lists to third parties. 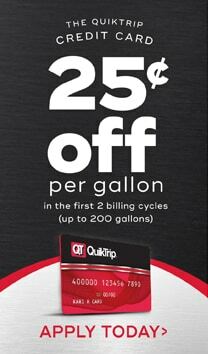 QuikTrip may, from time to time, contact you on behalf of external business partners about a particular offering that may be of interest to you. In those cases, your unique personally identifiable information (e-mail, name, address, telephone number) is not transferred to the third party. In addition, QuikTrip may share data with trusted partners to help us perform statistical analysis, send you email or postal mail, provide customer support, process payments or complete transactions, or arrange for deliveries. All such third parties are prohibited from using your personal information except to provide these services to QuikTrip, and they are required to maintain the confidentiality of your information. If you later decide you do not want your information to be used in these ways, please let us know through the opt-out procedures described below. QuikTrip keeps track of the sites and pages our customers visit within the Digital Properties in order to determine what QuikTrip products and services are the most popular. This data is used to deliver customized content and advertising within the Digital Properties to customers whose behavior indicates that they are interested in a particular subject area. By providing the personal information of a person other than yourself or that of an entity into any of the above areas, you are solely responsible for obtaining from such person or entity any and all required rights, releases, consents, clearances, licenses, and other authorizations necessary to exploit and otherwise use their information (the 'Clearances'). By submitting such information, you represent and warrant to QuikTrip that all required Clearances have been obtained and QuikTrip is entitled to rely on the same. Please keep in mind that if you directly disclose personally identifiable information or personally sensitive data through QuikTrip public message boards and/or social media channels, this information may be collected and used by others. QuikTrip encourages you to review the privacy statements of websites or mobile applications you choose to link to from the Digital Properties so that you can understand how those websites and applications collect, use and share your information. QuikTrip is not responsible for the privacy statements or other content on websites and mobile applications outside of the Digital Properties. 1. Information Security. QuikTrip does not warrant the security of your information. However, we utilize encryption and/or security software to safeguard the confidentiality of personal information we collect from unauthorized access or disclosure and accidental loss, alteration or destruction. 2. Evaluation of Information Protection Practices. Periodically, our operations and business practices are reviewed for compliance with corporate policies and procedures governing the security, confidentiality and quality of information. 3. Employee Access to Your Information. In general, our business practices limit employee access to personal information and limit the use and disclosure of such information to authorized persons, processes and transactions. At QuikTrip, we are sensitive to the need to protect the privacy of children who use the Internet. QuikTrip does not specifically target any products or services on any Digital Property to children under 13 years old. Further, we will not knowingly collect personal information from children under the age of thirteen (13) consistent with the Children's Online Privacy Protection Act. Individuals under the age of 13 should only use the Digital Properties with the permission and under the supervision of a parent or guardian. Individuals under the age of thirteen (13) should not attempt to provide any personal information on any of the Digital Properties. If we become aware that a child under the age of thirteen (13) has provided personal information to us through our Digital Properties, we will delete it from our files. If you are a parent or legal guardian of someone under the age of thirteen (13) whom you believe has submitted personal information to us, please contact us at digitalhelp@quiktrip.com, and we will take appropriate steps to remove such information from our files within three business days. Please note that the Digital Properties may contain links to content providers that collect information from children under the age of 13. QuikTrip has no control over such content providers and is not responsible for the privacy practices or the content of other websites or mobile applications. Because the Internet and mobile applications offer open access to a wide range of information, it is important that parents supervise and prevent access to inappropriate content, email or chat sessions. You have the right to withdraw your consent to receive Electronic Communications from QuikTrip; however, you acknowledge and agree that QuikTrip has the right to restrict or terminate your access to certain aspects of the Digital Properties if you withdraw your consent to receive Electronic Communications. If you wish to withdraw your consent, either click the unsubscribe link from the QuikTrip email you received or follow the opt-out instructions sent via text. BY USING THE DIGITAL PROPERTIES YOU RELEASE, WAIVE AND DISCHARGE QUIKTRIP FROM ANY AND ALL LIABILITY RELATED TO, AND AGREE THAT QUIKTRIP IS NOT RESPONSIBLE FOR: (I) ANY DISCLOSURE OF PERSONAL INFORMATION MADE BY YOU TO A THIRD PARTY THROUGH YOUR USE OF THE DIGITAL PROPERTIES; (II) ANY DISCLOSURE OF PERSONAL INFORMATION OBTAINED ILLEGALLY FROM US; OR (III) ANY ACCIDENTAL DISCLOSURE OF PERSONAL INFORMATION MADE BY US.